I learnt this Sāmbar from my neighbor. Its very simple. Usually for hotel style sambar recipe,we used to add freshly roasted & ground spices.For this sambar, just besan flour is enough.I had tasted this kind of sambar in some hotels especially in Tirunelveli and Madurai.Do try this and let me know how it turned out.Lets see how to make this easy, South Indian Idli Sambar recipe. 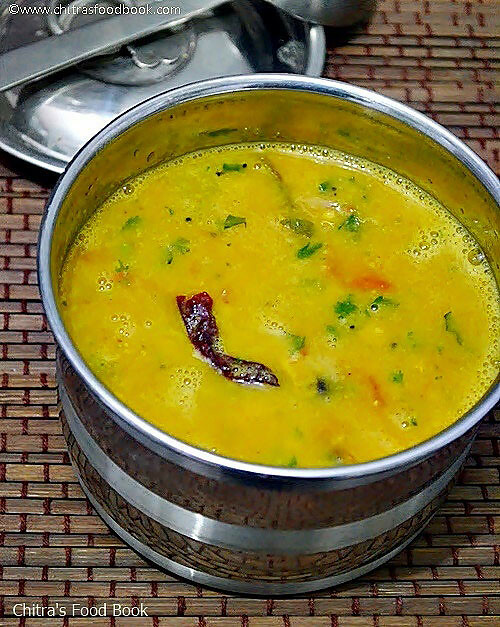 In a pressure cooker, take the toor dal, chopped vegetables, turmeric powder, hing and a drop of oil. Add the required water and cook for one whistle in low flame. 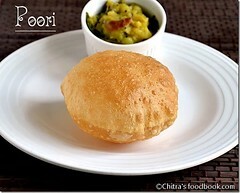 Mash the dal and keep it apart.Dilute besan flour in 1/4 cup of water without lumps and set aside. 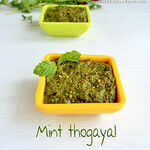 Heat a kadai with oil and temper the ingredients given under “To temper”. Sauté the onions, slitted chillies,curry leaves, hing & tomatoes. Saute till tomato turns mushy. Now add the tamarind extract and sambar powder. Add more water if necessary.Add the cooked vegetables , little asafetida and fresh curry leaves. Allow it to boil for few minutes. Then add the cooked and mashed toor dal. Add besan water to the sambar. Boil well for few minutes without lumps .The sambar starts to thicken. Add more water if necessary. Finally switch off the stove and garnish with coriander leaves. **For relatives, add a tsp of ghee at the end and close the bowl. 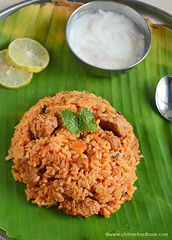 Yummy , aromatic sambar is ready to enjoy with piping hot idlis , vada or pongal !! 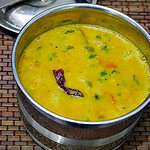 For idli sambar, dal should be dominant and hence less tamarind is added. 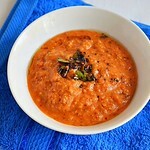 If u want the sambar to be more tangy add lime juice at the end after switching off the flame. For more spiciness, add more green chillies while sautéing onions and tomatoes. 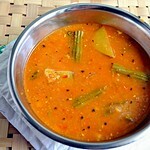 If u feel the sambar is too thick, add more water, little tamarind extract, salt and sambar powder. Boil for sometime. Similarly if u think the sambar is more spicy or tangy, add little besan flour and water, allow it to boil. Adjust salt. I enjoyed this yummy sambar with my oats barley idli and onion thokku ! 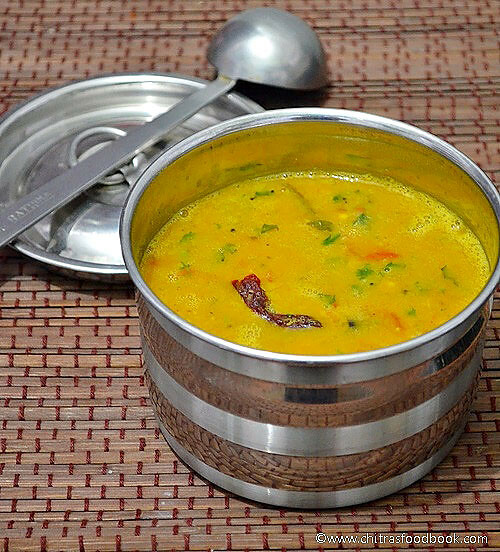 Hi Chitra, Happy New Year to you:-) Your version of sambar with a twist of adding besan sounds very delicious..Oats&Barley idly with this sambar sounds like a healthy combo. Happy New Year wishes to u...hotel sambar recipe sounds so yum and looks inviting...will try this for sure...thanks for the recipe..
hotel sambhar always tastes great and thanx for sharing this recipe..Happy New year to you and your family. Happy new year Chitra!!! this is super flavorful sambhar n i love the idly.. Delicious combo n healthy tooo, luv the flavour!! 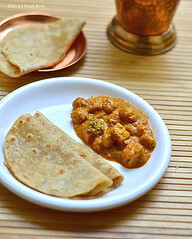 Hotel style sambaar is looking really yum...surely I will be making this. 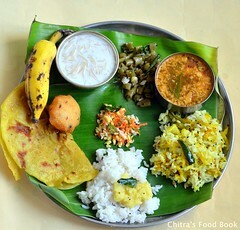 Wow...luv the make up tips ,chitra...Yummy breakfast..Happy new year to you. சாம்பாரில் கடலைமாவு சேர்த்து செய்திருப்பது ரொம்ப நல்லாயிருக்கு!! some awards waiting for u in my space..plz come n collect them..
delicious recipe... will surely try this... happy new year..
yummy n delicious hotel sambhar!! Love this sambar very much. You have done it perfectly Chitra. 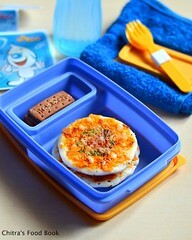 My most favorite combo for idly always....yummy! 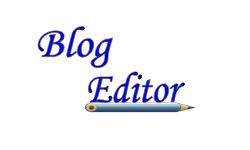 Happy New Year Chitra! The sambar looks delicious with oats idlis! Sambar looks delicious.Happy New year. Yummy n tasty combo Idli Sambar.Luks Delish! 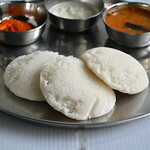 Wow, very nice recipe for any day and love the ease of cooking idlis.